We were delighted to welcome Brian Caffrey, Birdwatch Ireland Atlas Coordinator to Kilmore Church Hall, Cavan on Wendesday 10 October last. Brian last talked to us back in June 2007 prior to the start of the Atlas survey work. He encouraged us all to get involved in the project and also joined us for a number of Atlas Roving Events locally during the four years of the project. We were all very eager to hear what he could tell us about the findings of the Atlas survey work and all present enjoyed Brian's very informative presentation. Brian sent on the following report. I always look forward to meeting up with the Cavan Branch and was delighted to receive the usual warm welcome at Kilmore Church of Ireland Hall earlier in the month where I gave a talk on the Bird Atlas 2007-11 results. 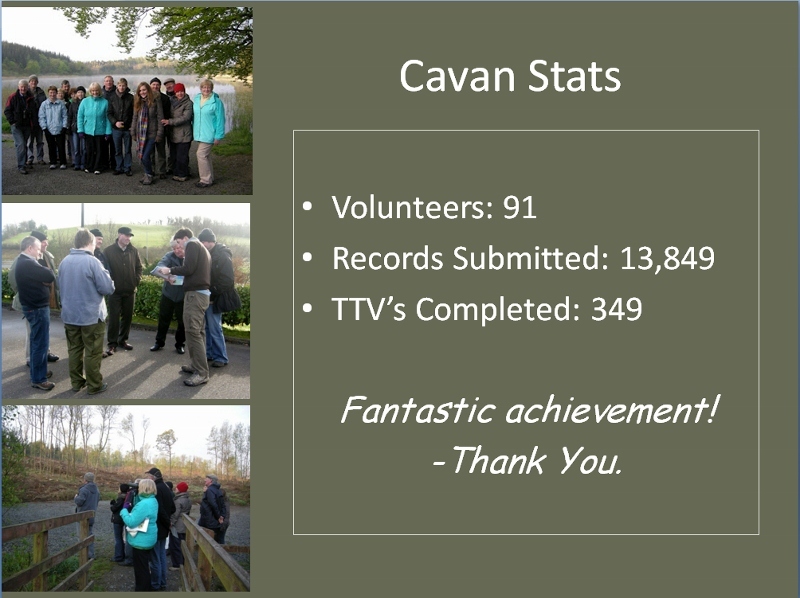 With a staggering 1.3 million bird records entered to the Bird Atlas in Ireland, I was nice to meet with some of the 91 volunteers in Cavan who submitted an impressive 13,849 birds records during the project in the county. We soon moved on to the bit that everyone was waiting for; a sneak preview of the latest species maps. We started off with a selection of farmland birds: Yellowhammer, Corncrake, Curlew, Barn Owl, Redshank and Tree Sparrow. 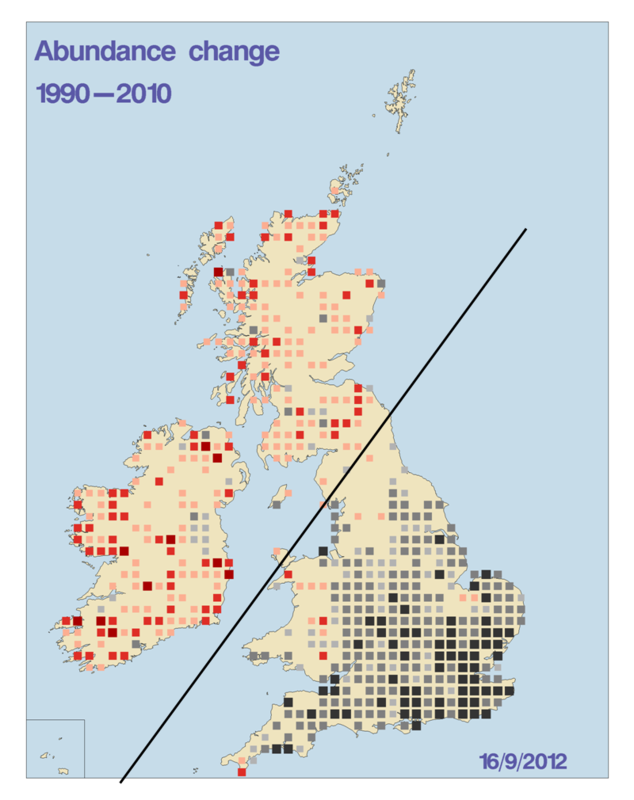 It was the decline in farmland birds that proved to be the big story in the last breeding atlas (1988-91), and sadly the maps showed the decline has continued at an alarming rate for many of these iconic species. 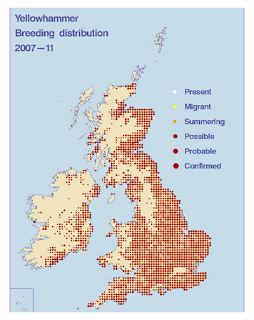 Yellowhammer map shows a large contraction in range in the north, west and south west of Ireland. Next we looked at a number of species that were showing very interesting, albeit concerning trends: Willow Warbler, House Martin, Sedge Warbler, Cuckoo and Starling. 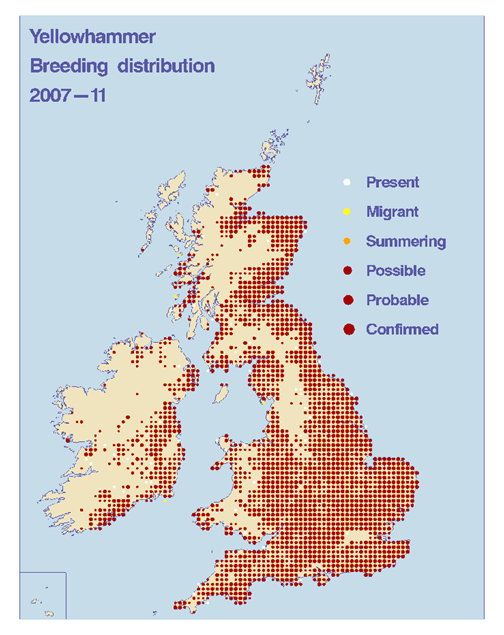 A striking north-west/south-east trend is starting to emerge for a number of species (mainly summer migrants), which is possible related to climate factors. Will this be the big story of the 2007-11 Atlas? 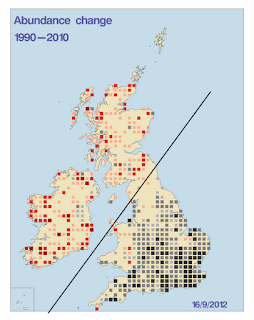 Willow Warbler Map: Red indicates an increase in numbers while black indicates a decline. Then we finished up with Buzzard, Raven, Siskin, Blackcap, Great Spotted Woodpecker and Little Egret, a few good news stories of expanding species and new arrivals to our shores. It’s not all doom and gloom! There were no records of little Egret in Ireland in the last Winter Atlas 1981-84. 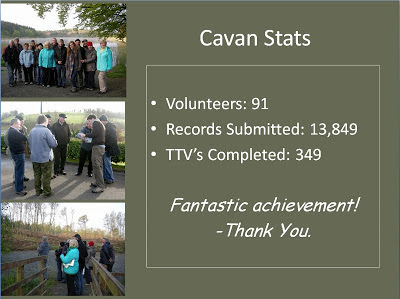 Before everyone disappeared off home, there was a quick reminder about all the BirdWatch Ireland surveys which require volunteer help http://www.birdwatchireland.ie/Ourwork/Volunteersurveys/tabid/1217/Default.aspx . With the Autumn migration now well underway there was a particularly focus on BirdTrack www.birdtrack.net , a fantastic online system for entering all your bird sightings.